On Friday 22 August, in Cathal Brugha Barracks, Kilmainham Tales Teo. 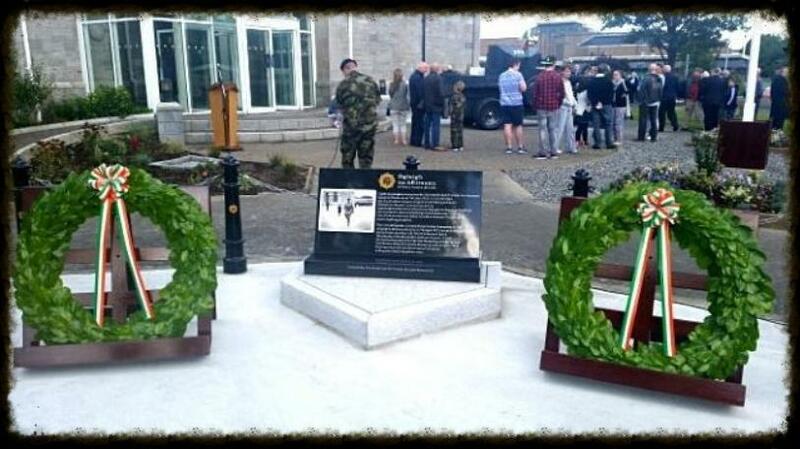 was among a select audience of family and friends of serving members of the Defence Forces who attended this commemoration. This was a superb day laid on by the men and women of our modern army to commemorate their first Commander-in-Chief. Several tributes were made to General Michael Collins by senior Army officers, including his successor today, Army Chief of Staff Lt. Gen.
Conor Boyle spoke of the legacy of Michael Collins, who died at Beal na Blath, Co. Cork exactly ninety-two years ago. After the speeches, and before an Honour Guard, Lieutenant General Conor O'Boyle Ms. Helen Collins, grand niece of General Michael Collins, laid wreathes at the monument to Michael Collins. Mary Claire O'Malley, another grand-neice, was also present. the barracks and military equipment were arranged. A death mask of Gen. Michael Collins was later donated to the Barracks' museum by Noel McDonnell and family and is now on display there. in the afternoon there was a special talk on Gen. Collins and his life but, unfortunately, we were unable to attend - our loss, we hear. Our photos of the event are below.